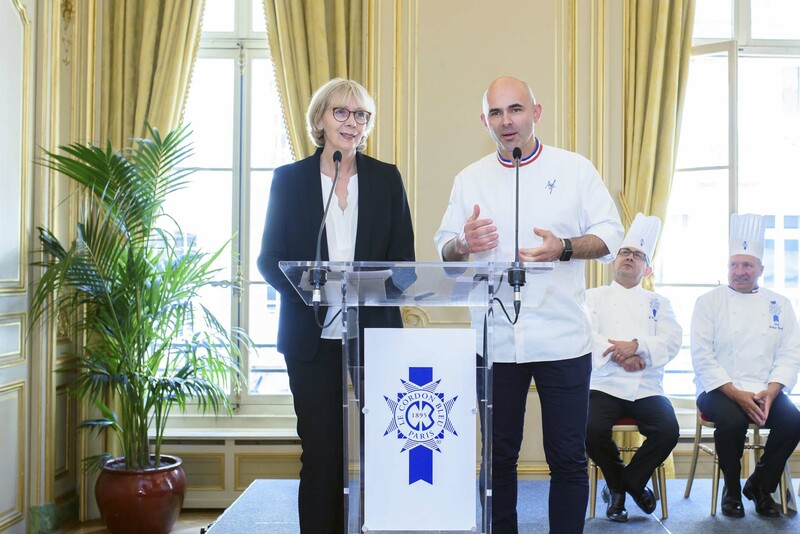 On 7 June, 2017, Angelo Musa was class patron at the graduation ceremony for Le Cordon Bleu Paris Culinary Arts students (Grand Diplôme – Cuisine Diploma – Pastry Diploma). More than 150 students, of 45 different nationalities, received their seal of excellence in the company of their families, friends and Chef Instructors. Chef Angelo Musa, executive pastry chef at the Plaza Athénée hotel, 2003 World Pastry Champion and One of the Best Craftsmen in France (Meilleur Ouvrier de France - MOF) 2007, awarded the Pastry Diploma. Pastry graduates were able to benefit from the invaluable advice of the chef to better prepare for their future careers. There is one thing which to me seems essential: when you start working, respect nature, work in harmony with its rhythm, follow the seasons and respect ingredients, their choice is of upmost importance in our profession. Also, take the time to grow, to assimilate knowledge; don’t be in too much of a rush. During their training programme, the students performed exceptionally well in all the challenges with which they were faced, and their motivation, alongside the permanent team of Chef Instructors, was clear to see. Culinary Arts Director, Chef Eric Briffard (MOF), and his Assistants, Philippe Groult (MOF) and Fabrice Danniel, Pastry Technical Director, wished them every success and, above all to excel in their career. We would like to welcome all our graduates to Le Cordon Bleu extended alumni family around the globe. Who is Chef Angelo Musa? Angelo Musa, 2003 World Pastry Champion and One of the Best Craftsmen in France (Meilleur Ouvrier de France - MOF) 2007, joined the Plaza Athénée hotel as executive pastry chef. At the beginning of April 2016, Angelo Musa was appointed head of the pastry teams at 25 avenue Montaigne by Alain Ducasse and François Delahaye. With a wealth of experience in France and abroad – this Nancy native with the blue/white/red collar (his greatest pride!) tackles his latest challenge with poise: “I am delighted to have the opportunity to be part of the team at the Plaza Athénée, alongside Alain Ducasse, and to work hand-in-hand with pastry chef Alexandre Dufeu”. His vision? Balance is his motto! First and foremost, balance of flavours (which can be bold but must marry delicately with other flavours), next comes balance of textures (so that the palate can experience different sensations: soft, crisp, melting …) but also a balance between sweet and sour, or acidic.